I am a full time chess professional I play coach and run a chess business. I have been playing for more than 20 years and coaching for more than 12. I am a FIDE master and 3 time SA chess champion. I am a FIDE trainer and run ChessExcellence which is a FIDE certified chess academy. Daniel scored the norm at the Uige City International in June but due to some complications the event was only rated now. Daniel had a truly brilliant performance and now moves to number 1 on the FIDE list of active South African chess players. Here below is a typical Daniel crushing win. Daniel has always had a very good tactical vision and a particular fondness for Knights. Here the poor victim of Daniels sharp play is an Angolan national team regular. Daniel had a superb performance rating of 2514. Hello to everyone reading the blog. As the year comes hurtling to a close we as usual have the premium South African chess events looming. This year the South African Junior Chess Championships will be held in Durban with the venue being the ICC. There are a lot of changes as CHESSA looks to align with the international best practice. We have had this system for as long as I can remember and that’s 20 years!. We have been needing a change. This is an update of the state and format for the Junior nationals. Many people are uninformed of the state of play and I hope to give clarity and help with debate. Please note that these rules might still change but I will keep the blog updated. At this stage the team event will be a 9 rounds Swiss run using the same rules as the Olympiad. All age group teams will play in the same section, giving a chance to every team to compete for fair placing. The 9 rounds is maybe too little but its a big adjustment from where we are coming from. It will bring us inline with international standards as the Senior and Youth Olympiad are run this way, as well as the world club championship’s. The advantage of this system means that teams don’t need to gain promotion to be able to compete for the top spots. In the past regions have had teams capable of winning a medal but unfortunately they were not in the Championship section. The time control will be 90 minutes a side for the whole game and NO ADD on time. The proposed schedule will be 3 rounds on the 15th, 3 rounds on the 16th, 2 rounds on the 17th and 1 on the 18th. It seems like a lot but we want teams to get the chance to prove how good they are and if we don’t have enough rounds in a Swiss the placings will not be fair. They still need to decide the sections for the prizes but the Olympiad has many category prizes, so I expect them to follow the same route. Their will be 2 kinds of board prizes one for total percentage score and the second for highest performance rating. This again is the international standard. I will keep updating as things change. Please post your comments and questions and I can help with the information. Rodwell Makoto wins the 2012 SA Open in a sprint finish. Well done to Rowell Makoto on winning this years SA Open. Rodwell was declared the title winner on tie break break as he was tie with GM Ahmed Adly, IM Johannes Mabusela and Daniel Cawdery. Let set the background before the last round. In first place, by half a point, was GM Thal Abergel. Then a chasing pack of 8 players including GM Adly, IM Mabusela, Cawdery, GM Fernandes, Van Den Heever and Makoto. With the pairings as follows. The first result on the board was the controversial win of Cawdery over Kobese. Watu’s alarm went off after they had played 8 moves. Watu is no stranger to this type of default in the SA Open as he lost in a similar way during the 2009 SA Open. Lets look at the games that decided matters. First we have Adly’s victory against Abergel. Adly has been very lucky in this tournament and has been playing far below his rating. This game is no exception and it wasn’t until GM Abergel got his Knight in troubl on the side of the board on move 32, that Adly had any winning chances. Next we have a very nice win by IM Mabuslea. Johannes has also been guilty of some very poor chess in this event but can be very happy with this combative win against GM Fernandes. GM Fernandes will be very disappointed with how things finished for him, as he was running away with the event until his clock caught up with him. GM Fernandes time management was terrible during the whole event. He regularly left himself in situations with 20 moves to make in less than 20 minutes. This doesn’t allow a player to make the best decisions and often this is needed to get a win. So if he had handled his time better I am sure we would have had a different winner. Next up we had the all cape clash: Western Cape V Eastern Cape- Klaasen V Van den Heever. What also made this such an interesting clash is the very different approaches of the two players. Donovan has a very good theoretical memory and rely’s on brute force calculation to solve problems at the board. Calvin believes in trying to understand the idea of a system and what he is trying to achieve.He rely’s on a loose assessment of his positions to solve problems at the board. Think of it like a tornado meets a tsunami! In the end Calvin misses a win with Bc5 but I think both sides had chances to win this one. To finish off we have Rodwell Makoto’s winning game of the last round. I think also his most ascetically pleasing win as well. I feel a deserved overall winner as Rodwell had the most consistent chess of the event. GM Abergel breaks away form the chasing peloton! No you’re not reading the reports form the Tour de France its the SA Open story of round 9. With 2 rounds to go GM Thal Abergel of France has snatched control of the 2012 SA Open from GM Fernandes. As I said in an earlier post if GM Fernandes doesn’t improve his clock management skills he will lose control of this event. Well don’t call me Nostradamus but it came true! 1) Throw the kitchen sink at you opponent and if that doesn’t work throw the bathroom one as well! The basic point is to throw caution to the wind and attack you opponent. 2)Worry your opponent to death! Here the basic idea is to play a very slow postion were the game can go many directions. You want your opponent to over stress about his tournament situation and because of his nervousness crack. 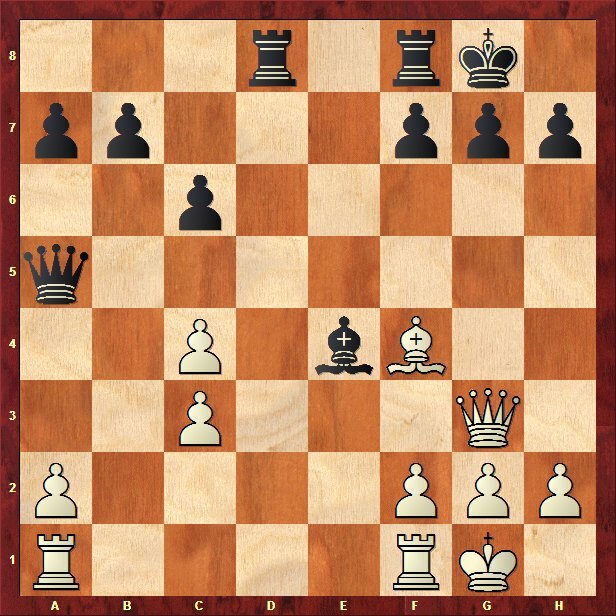 This technique was used by Kasparov against Karpov in their 3rd World Championship match, when Kasparov had to win to retain his title. In this crucial round 9 clash GM Abergel chose a version of the first. He imbalanced the position as soon as possible with a dubious piece sacrifice. 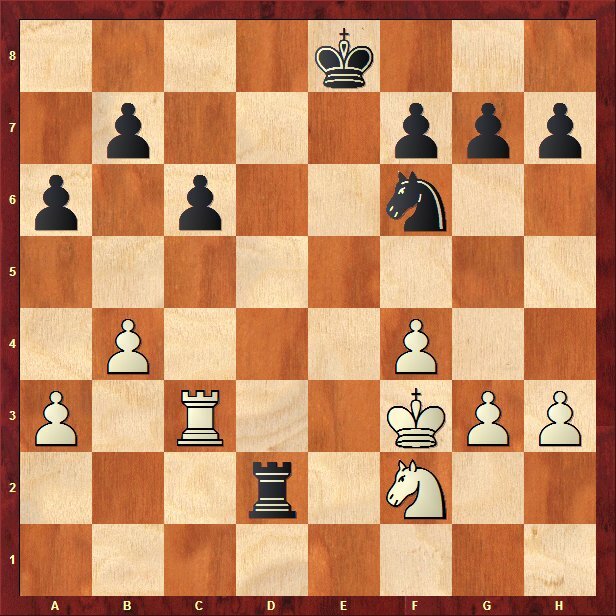 The variation is well known in theory to not give white enough but the positions are not simple to play. GM Fernandes began to use too much time to find a solution to his development problems and ended up giving too many pawns to force his own development. GM Abergel then forced the battle around move 30 just when GM Fernandes had very little time. The complex position was too much and shortage of time was too much. GM Abergel now takes the sole lead after a very nice win. On Board 3 Watu bludgeoned his opponent into submission. He clearly wasn’t in a mood to allow any upsets! On board 4 Laura Irving and Donovan Van Den Heever engaged in a very sharp battle from a Benoni. Laura made far too many weaknesses and Donovan too full advantage with some nice tactical blows. On board 4 IM Mabusela walked a way with an easy win. Aguirre played far too passively in the opening and didnt appreciate the light sqaured weakness he was creating. Its actually quite amusing (as long as its not happening to you!) how Johannes picks of every white pawn that moved to a light sqaure on the 3rd rank. First h3 then d3 then b3 oops he forgot about f3! Don’t worry he went back and got that too. So as we head into the weekend GM Abergel holds a narrow half point lead over the chasing peloton! With 5 riders err I mean players chasing hard on his heals! Its seems no one told Rodwell Makoto that playing a Grandmaster is tough. Rodwell has recorded his second straight draw to a GM in round 9 of the SA open. This time to number one seed Ahmed Adly. Adly out ranks Rodwell by more than 400 points but as Rodwell showed ratings don’t help you move pieces! A wonderful result for Rodwell who remains undefeated for the event. Rodwell pushed in the beginning of the game and secured a slight edge Adly battled back but with little material on the board could do nothing to put his opponent under pressure, a draw a fair result in the end. I”m delighted for Rodwell’s sake as he is a serious student of chess and has been working hard to improve his game for the last few years. Its funny how chess works as Rodwell has been spending more time recently on academic studies and now he is busy recording the best result of his career. Chess is a very funny sport! Ill give a more in depth coverage of the other game’s in a later post. The search for the perfect score is stopped! GM Fernandes just ran out of time. In the last couple of rounds GM Fernandes has been using a lot of time in the early part of his games, and leaving himself with a lot to work through with little time. In this round he couldn’t solve his problems in time, by move 15 Fenandes was down to less than 15 minutes on his clock. Well done to Rodwell for holding on! White had a clear edge out the early opening but the combination of Fernandes poor clock management and Rodwell’s play ensured his edge didn’t get out of control. I think Daniel will feel quite disappointed with this result as he had a small edge out of the opening, but couldn’t build anything further. Black was then able to seize the initiative by exploiting the very weak e3 square. The game then turned into a model game on how to exploit an invasion square. The deciding moment of the game came just before the time control with both players short of time, first Daniel missed his best resource with 36.Ke2. Instead he blundered with Nd8 allowing the neat idea 36…Qh5! to trap the knight, but GM Abergel also erred in time trouble trapping the Knight in the wrong way. Unfortunately Daniel was the last to blunder missing that his Knight was lost in all variations he didn’t get enough compensation. The game then turned into as is so often said “a matter of technique”. 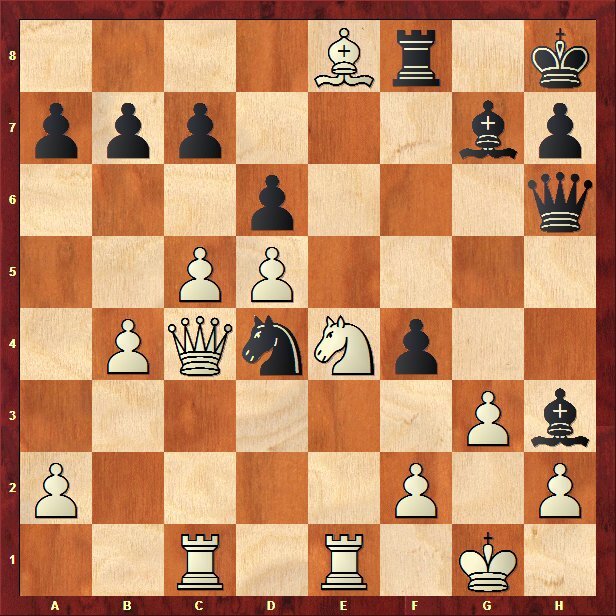 I actually recommend to readers to setup the position on move 40, and play against an engine. This will be a great exercise in converting a technically won position. On board 3 we had the upset of the round. At first it would seem an upset that Donovan drew with Mark Lewis but when one goes through the game. Its an upset that Mark didn’t play on and collect a win. Donovan over pressed in the opening and ended up tying himself into knots. Watu recovered from his disappointing loss from round 7 with a comfortable win. Adly won a violent game in a Dutch Staunton gambit against Justin Wilkin. It seems Adly was taking his opponent too lightly and allowed him some very good chances. Justin unfortunately blundered with 19…Kd7? He needed his King to cover g6 from f7, which would allow black to target the pawn on h7. Justin then blundered in a much worse postion to end the game. On board 6 IM Mabusela collected a win against former Junior closed champion Benjamin Hercules.The game started as a Zaitsev variation of the Ruy Lopez, made famous by the Kasparov-Karpov matches. Ben played a sub variation and seemed in an ok position but never really achieved full equality. Ben is a talented player but also seems to lack a consistent approach to his chess studies, as many of SA’s current junior players seem to suffer from an allergy to consistent dedicated chess work. Now just to test your brain we have a simple tactic from Laura Irving’s win against Musa Simutowe. Black to play and win. Now we have the game of the round for me. Calvin Klaasen outplaying Alexander Kromhout with a instructive strategic win. First an exercise form the game. 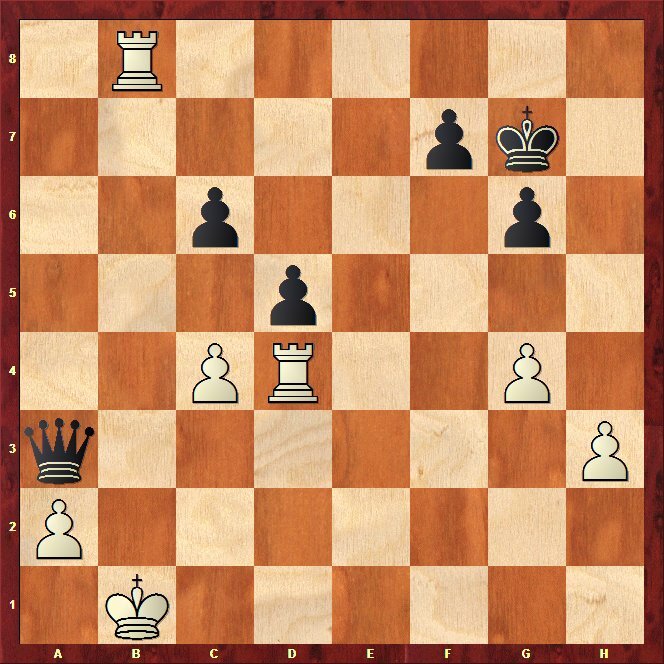 How did white to play turn his positional edge into a material advantage. A very nice win from Calvin, he used his superior structure to its fullest. So as we move into the final straight GM Fernandes grip slips just a little. If he is not able to solve his poor clock management then he will lose this event in the latter rounds. He is now nursing a narrow half point lead over GM Abergel, with No1. seed GM Adly now just 1 point off. Round 9 see’s the first all GM match up of the event with GM Fernandes on the Black side against GM Abergel. Rodwell Makoto will be preping deep into the night trying to keep his good run going against GM Adly. Further down we have the usual skewed swiss pairings with the seeds outranking there lower rated opponents by more than 200 points on every board. One thing we can guarantee with this SA Open not all the seeds will come though with wins. Unfortunately because of a technical glitch Ill be unable to give you the games of round 7, but I will endeavor to get some posted later. Lets update what happened in round 7 on Board 1 there was to be no home nation celebrations as GM Fernandes continued his perfect score with a black win against IM Watu Kobese. This leaves Fernandes with a strangle hold on the event . On board 2 Rodwell Makoto defeated Musatwe Simutowe. On Board 4 Alexander Kromhout drew with IM Johannes Mabusela. Johannes has failed to get going in this event after his blunder in round 3. With Daniel Cawdery and Donovan Van den Heever collecting black wins on 5 and 6. GM Adly continues to his march up the leader board. So now we move into the decisive phase of the tournament, with the next 4 rounds deciding the event. With GM Fenandes emerging as the favourite itll be interesting to see how the round progresses. A very disappointing result for Cawdery I would have thought he would have kept playing a little trying to break with f5 to weaken blacks King. Daniel just seems to be struggling to get going in this event and is unable to force his type of positions with white. A strange game from Mabusela, he seems to be low on confidence. Black was always struggling to prove he had enough compensation for the pawn, as White’s position became easier he let the draw slip. After some wonderful results for young Craig Bornheim Musa Simutowe shows the rest of the field how to take care of him. Craig is still a very incomplete chess player. Here he shows poor strategy by attacking on the King flank, when there were still under developed pieces on the Queen side. Craig will be very difficult for players to handle in this event this was not his best game. Now for some comic relief. Well for those who weren’t involved in this game. just to give you some background both players had less than 20 minutes left for their last 25 moves. What is quite appalling is that black would just win by pushing his h-pawn. A great example of why one should always play to the bitter end. White: GM Fernandes who has a clear preference for calm clear strategic positions and handles technical positions very well. Black: Donovan van den Heever who has very powerful calculation skills and handles concrete positions well. A super technical win by GM Fenandes. He controlled the type of game from the outset. Move 7.Qb6 is actually a very strong move for his desired game. He takes off the queens and forces black to play a technical position. He then slowly outplays black in a position were Donovan’s skills are useless. A very well played game again GM Fernandes. Now we get to the most entertaining game of the round. White Calvin Klaasen. Calvin has the potential to be one of the countries best players but needs to be more serious about his chess studies. Black IM Kobese. Watu is one of the countries best players and is continually among the favorites to succeed in any SA event. What a crazy game! Calvin just didn’t have enough time to secure the win. He was down to seconds for the 5 moves before the time control. Had he found 36.Qf3 or Kg2 then this would have been a memorable win for him. So as we move into round 7 GM Fernandes leads the way and he will face IM Watu Kobese who leads the charge of the SA Players. So lets get to the games. Round 5 turned out to be a blood bath for the higher seeded players. The first stunning result was Top seeded Ahmed Adly’s loss to Craig Bohrnheim. Craig has done wonderfully well in the sharp positions requiring calculation. First holding a draw to 7th seed Daniel Cawdery and now this Win against the former world u20 champion. So this is the deciding moment in their game. 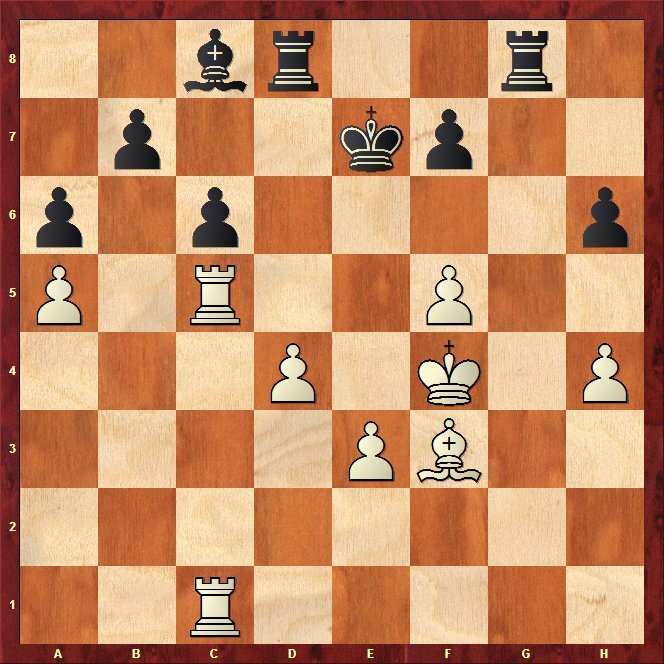 The opening already went very wrong for Ardly in a Cambridge springs defence and now Craig Simply wins the exchange with Bc7. Easy as can be Craig went on to win very nicely. Daniel is very good in sharp positions and Amini made a mistake playing such a double edged line. Next of the seeds to fall is South Africa’s top entry to the tournament IM Watu Kobese. Watu has a very strong active strategic style. Here Bhawodien demonstrated his ability to create active counter chance to compensate for his weak b-pawn. Next on the list of seeds to drop points was IM Johannes Mabusela. Who ever said having a title doesn’t get you free points? Here Johannes simple blundered a piece trying to be too fancy on move 14. and ended up getting a draw because of his reputation. I’m sure Mabu will be better later in the event. A word of advice for lower rated players. When your opponent offers you a draw ask yourself: “what are the chances of me losing from this position” If I play normally. In the position above the odds of White losing are very low. Just in case you were left wondering whats the point of ratings, here is a game of Donovan van Den Heever showing his superiority. Here Craig made a common mistake instead of defending the problems on the Q side and waiting passively. He tried to create active counter-play on the queenside. Hindsight is an exact science! Its never easy to pick how to handle that type of position but well played by Donnie. This is a GM showing he’s a GM! When going through the game one might think that there’s nothing special here but by move 15 Fernandes was down to less than 30 minutes to his opponents hour. Plus black is just worse with white having all the play. he then proceeds to secure his position and then finally seize the initiative with 25…Ne6. This game is a great example of quality play under pressure. Its really not easy when your clock is ticking down you cant find any good ideas and you just look at your opponent who has double your time and so many good things to do. Well played to GM Fernandes. So here on move 33. white has just played Rc3 trying to continue the struggle. What did black end his resistance with. Here White has just played Bxe8 trying to restore some material balance. What did he miss? Here GM Ardley has just saved his Bishop with Bxe4. What could he not save? chesstape on The search for the perfect score is stopped!